Mother's Day, so I'm putting my feet up and perusing my favourite inspirational magazine dwell and making a list of all the things I want to get after I win the lottery, when I glance at the special advertising section for the Saturn Sky Roadster. This takes the form of a suggested road trip around Long Island, NY to see the modern and post-modern architecture. 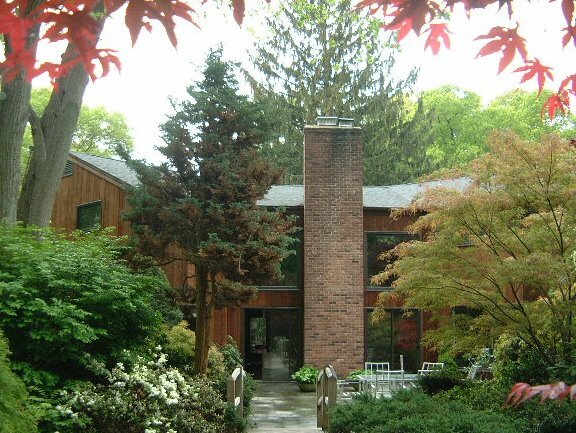 And the proposed itinerary takes in the works of the celebrated architect Andrew Geller who worked on the Leisurama prefab homes for Macy's and designed the Pearlroth House and, coincidentally, who designed our house in 1968. It's a long way to drive from Shelter Island to Manhattan without stopping to see some mid-century architecture. So I suggest, should you ever follow the indicated route, that you make a detour off Rte 25A and see another Andrew Geller masterpiece. I'm so lucky to live in this unique house and I want to share it with everyone.